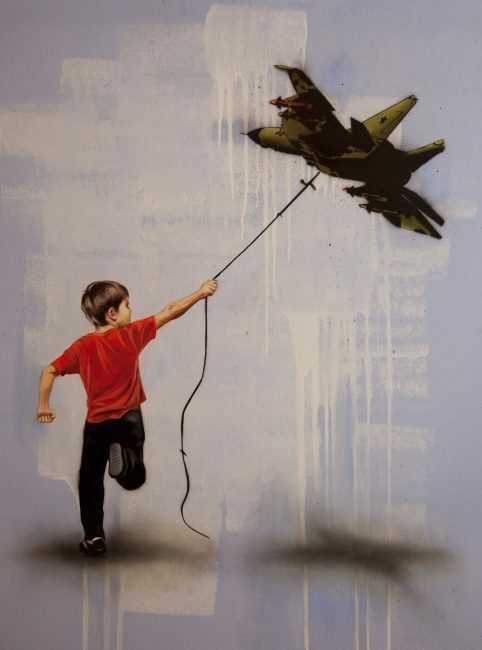 This January Guy Hepner is pleased to offer new unique works by UK street artist Hijack. Son of renowned French artist Mr Brainwash, Hijack has gained attention in his own right and is noted as one of the most talked about, up and coming urban painters today. Hijack has evolved as an artist and has fashioned a unique persona which compliments the imaginative turn from his traditional style. Based in Los Angeles, Hijack started as an underground street artist, silently stenciling the streets at night. He targeted Los Angeles’ most heavily trafficked areas – from the hikers in Runyon Canyon to the tourists of Melrose Avenue. 2017 saw a return to the Art Fair scene for Hijack, exhibiting in Art Palm Beach and Art Miami. Hijack’s new work takes a step away from his stencil beginnings, as he creates large scale canvas paintings. 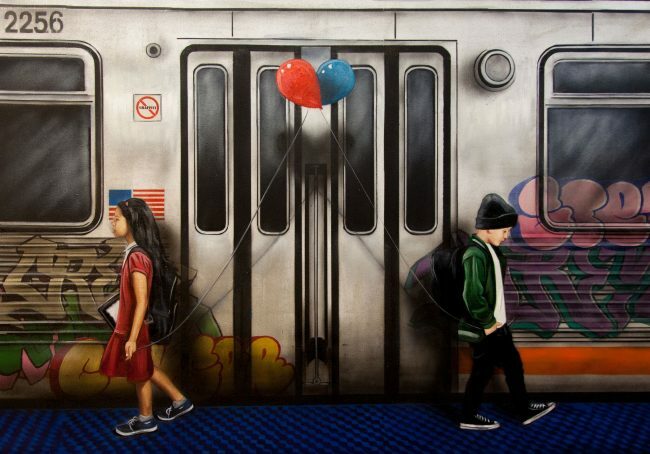 A 50 by 40 inch oil painting titled Graffiti questions the authenticity of the artist’s style itself. 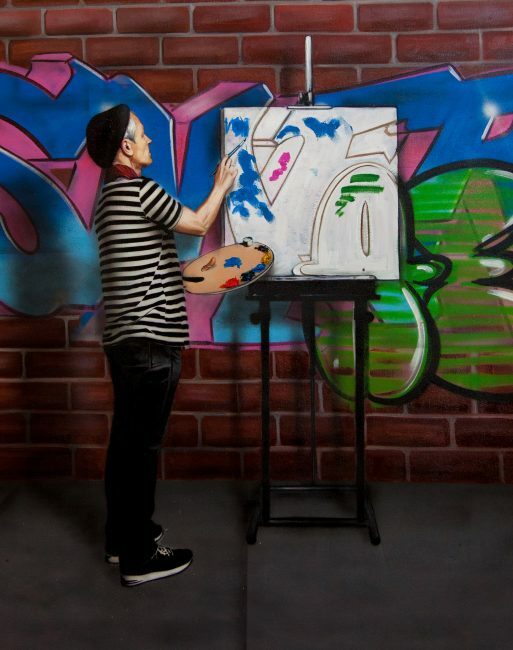 The image shows a mime painting a canvas to mimic the graffitied wall in the background. Commenting on street arts place within the traditional gallery setting, the imagery reflects the ideology of an artist looking into a mirror. We see Hijack asking questions about urban art, his work and himself and questioning the commodification of street art. Puzzled, also 50 x 40 inch on canvas, takes a more external view on contemporary social relationships. 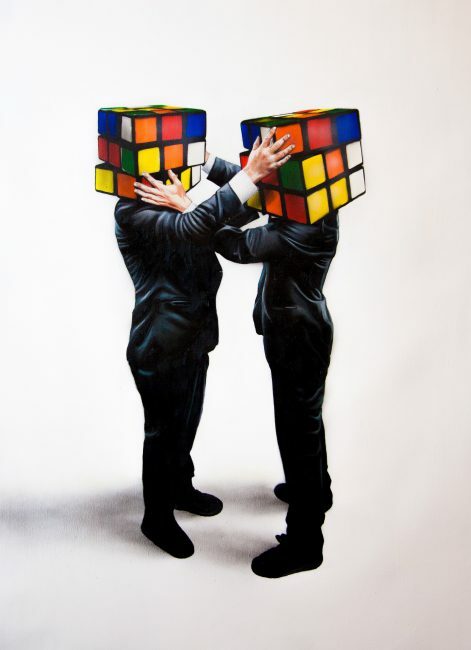 The work depicts two man dressed in suits trying to solve the rubix cube, a replacement for their head. This visually startling image highlights the challenge of solving the puzzle of the human mind, while focusing on others and their exceptions before ourselves. To find out more about Hijack or to inquire about available paintings and prints please contact Guy Hepner with phone or email today.